Here at Dallas Podiatry Works, we provide treatment for many foot and ankle conditions that cause pain and impair functionality, but our preference is to know you were able to avoid an issue from developing in the first place. To help you with this, we have several Achilles tendinitisprevention tips that are actually quite easy to follow. Achilles tendinitis is a common source of heel pain, especially if you have recently increased the intensity or duration of your training sessions. It also can happen when you only participate in intense physical activity sporadically (like the proverbial “weekend warriors” who hit the courts and fields on the weekends). Gradually increase your activity levels. If you are just starting a new exercise or workout program, begin at an easy level and then gradually increase the intensity and duration of your training. Choose the right shoes. 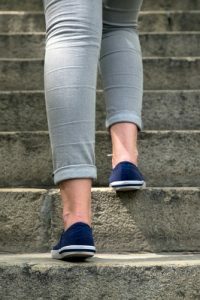 Your footwear should provide ample cushioning in the back for your heel, but also feature firm arch support to minimize the amount of tension in the Achilles tendon. Once your athletic shoes are worn out, replace them. Shoes that are otherwise in good condition, but do not provide enough support, might need to be supplemented with arch supports. Stretch every day. You can reduce your risk of initial injury and avoid a recurrence of Achilles tendinitis by taking some time in the morning to stretch your Achilles tendons and calf muscles. Additionally, use stretches before and after exercise to maintain flexibility in these soft tissues. Develop stronger calf muscles. Strengthening your calf muscles will enable both them and your Achilles tendon to better endure the stresses that come with exercise and physical activity. Cross-train. By alternating your high-impact activities, like running and jumping, with low-impact ones, such as cycling and swimming, you can reduce your injury risk. Even better, this practice contributes to greater overall fitness and helps prevent potential boredom from performing the same activities over and over. Our hope is that these Achilles tendinitis prevention tips will keep you safe while you perform your favorite activities, but come see us if any issue develops. We will accurately diagnose your condition and then create an effective treatment plan for you. If you’d like more information on the services we provide at our Plano and Dallas, TX foot doctor offices, or want help scheduling an appointment, call us toll-free at 972.566.7474 to speak with one of our friendly staff members.